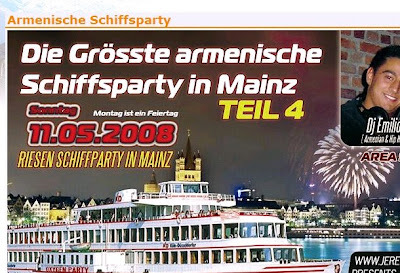 Armenien.am is very active, with a forum, and many events, And once you see that there is a "flirt area", the Armenian-Rhenish boat party will not really surprise you. And then there is another Swiss group, too: more francophone, more political, with a lobbying component, for example asking Swiss election candidates for a detailed response on Armenian issues. Surely a balancing act for politicians, since there are Turkish voter groups as well. You find them here. And again, some peculiar components: their major support the homeland project is... solar electricity. Last stop, Armenien.de. A neat, professional site, based in Cologne, referring to local communities around churches, structured as incorporated associations. 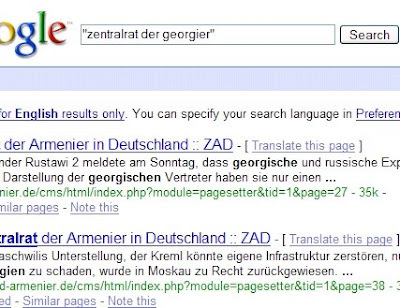 According to that site, there are 40.000 Armenians in Germany. No such Georgian hits! We are right back with the Armenian Central Council in Germany. It appears that in migration, the two cultures take very different directions in the level of their organization.